New biological information gleaned from the red vizcacha rat, a native species of Argentina, demonstrates how genomes can rapidly change in size. Researchers from McMaster University set out to study this particular species because its genome, or its complete set of DNA, is the largest of all mammals, and appears to have increased in size very rapidly. The rat's genome is roughly two-and-a-half times as large as the human genome, including 102 chromosomes versus 46 for humans, and is about twice as large as one of its closest relatives, the mountain vizcacha rat. The most recent common ancestor of these species existed only about five million years ago. "This genomic transformation is striking because it happened over a very short period of time in evolutionary terms," says Ben Evans, a biologist at McMaster and lead author of the new research published in the journal Genome Biology and Evolution. The mechanism behind that growth has caused much debate among scientists, some of whom suggest the rapid expansion is due to whole genome duplication when its entire set of DNA doubles. Whole genome duplication is relatively common in some groups such as plants—it occurred in ancestors of corn, tobacco, potatoes, and many other flowering plants, say researchers. Others argue the rat's rapid genome expansion is due to repetitive DNA—bits of DNA that are repeated many times in a genome—coupled with chromosomal fissioning, a process where one chromosome divides into two or more over evolutionary time. To settle the debate, researchers compared and contrasted genomic datasets from the red vizcacha rat and the mountain vizcacha rat. Their analysis suggests the genome grew quickly due to the expansion of a diverse set of highly repetitive elements, and they found no strong evidence of genome duplication. "This is interesting because these same mechanisms - the expansion of repetitive DNA - operate in humans and contribute to 'genomic baggage' or extra DNA. This can influence disease through the interruption of gene function," says Evans. Still, many questions remain. Researchers hope to further characterize the nature of those repetitive elements. For example, what are they and why did they expand? And are they still expanding? Researchers also plan to explore whether or not this genetic evolution played a part in the rat's high tolerance for a highly saline diet. 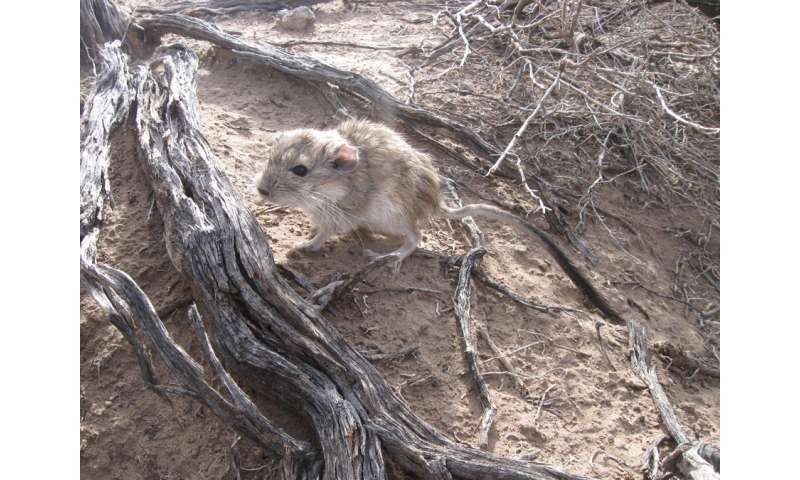 This species can feed on extremely salty plants that grow in its desert habitat, whereas the mountain vizcacha rat cannot tolerate the same diet.